3 April 2017 | Staff taking drink and meal orders using a digital device is a common thing in bars and restaurants around the world. Meanwhile, casual dining restaurant chains and airport F&B operators now let customers place their orders themselves, either via a tablet provided by the restaurant or via an app on their own smartphone. Now the airline industry is taking its first steps in this digitally-enabled F&B service. Besides the handful or airlines – including Air New Zealand, Japan Airlines, FlyDubai and Virgin America – that allow passengers to place orders via the in-seat IFE system, Emirates has recently issued so-called ‘Meal Ordering Devices’ to all its flight attendants who work in Business Class. Cabin crew recruitment portal PaddleYourOwnKanoo reports that the MOD smartphones connect to a plug-and-play WiFi router which is separate from the onboard connectivity system that passengers use. All the smartphones (Samsung Galaxy A7) are synced to communicate with one another for the duration of the flight, don’t have a SIM card, and have been blocked from running any applications apart from the bespoke Meal Ordering app. “The orders are taken on a hand held device and are instantly reflected on a tablet in the galley. Each order is then prepared immediately making service faster, more efficient and more personal,” said Terry Daly, Divisional Senior Vice President, Service Delivery at Emirates. 1 June 2016 | As part of a trend that sees airlines and airports welcome real-time feedback from passengers via digital channels other than social media, Sri Lanka’s national carrier, SriLankan Airlines has launched a comprehensive customer satisfaction platform which captures feedback from passengers throughout the journey, from booking to overall satisfaction measures after the return home. The airline has set up various ways for customers to share their impressions of service quality at its Colombo Ticket Office service counters, on its website, at the check-in counters at Colombo Airport, inside its lounge at the airport – as well as on-board through a dedicated application on iPads issued to cabin service managers. There is also a survey app incorporated into the airline’s IFE system, plus a feedback module incorporated in SriLankan’s mobile app. Once the journey has ended, customers also receive an email request to evaluate their journey. All surveys are available in five languages: English, Sinhala, Tamil, Chinese and Japanese. The passenger feedback which was initially gathered through a paper-based system has evolved gradually and the airline has now developed a full-fledged system where they could amass the treasured thoughts of passengers via digital media. Feedback data combines a full set of passenger profiles such as name, gender, ethnicity, travel preferences and their service aspirations with flight information into a data warehouse which further enables SriLankan to create a rich set of analytics, identify trends and strengthen customer relationships. “Today we are serving an informed, tech savvy, demanding customer. We understand the service expectation can be delivered by working smart. We recognise that technology can bring the speed and sophistication to serve today’s customer,” says Mr Chanaka Olagama, Head of Cabin Services, SriLankan Airlines. To ensure prompt responsiveness to service interruptions and critical issues which affect passenger satisfaction, real time alerts for immediate service recovery or negative feedback from passengers are sent to the supervisor of each customer touch point via text messages. 24 December 2015 | At airlinetrends.com we continuously monitor the global aviation industry for product and service innovations launched by airlines in response to cultural, technological, and economic changes that influence airline customers’ needs and expectations. The top product and service innovations we have selected to be among the most innovative concepts that have been launched this year reflect how airlines are becoming more creative in the design of new products and services as more airlines are embrading hospitality, design and technology as ways to differentiate the passenger experience. Many of the examples on our list contain a major digital component, as the rapid adoption of smartphones and tablets, the option to be connected anywhere and anytime, and the self-service mindset of connected travellers, has created a huge momentum for airlines to come up with innovative products and services. 15 September 2015 | The ubiquity of personal devices, the availability to be connected anywhere, and the self-service mindset of travellers, has created a momentum that sees many of today’s passenger experience innovations taking place in the digital realm. For example, Air New Zealand – already noted for its adoption of digital technologies – recently announced it has created the new role of ‘Chief Digital Officer’, as part of a rethink of how the airline approached digital innovation. The New Zealand Herald also reports that Air New Zealand has just unveiled a host of digital novelties aimed at removing customer pain points, and is working on the development and introduction of permanent digital bag tags, biometric scanners for luggage dropoff, electronic departure cards, and a tracking system for kids flying alone using digital wristbands. Some of these digital services will be introduced at the end of the year, while others are being looked at as a possibility for the future. One eye-catching innovation are the digital wristbands for unaccompanied minors (kids who are flying without their parents). Taking a cue from Disney’s ‘Magic Band’, Air New Zealand is planning to introduce an electronic tracking system for the 28,000 unaccompanied minors it carries per year. The high-tech bracelets replace a paper system and aim to provide parents with more peace of mind, as they will be able to receive real-time information on where their child is during the journey. How it works: According to the NZ Herald, unaccompanied minors will be offered a silicon wrist band in the colour of their choice which contains a chip that connects to a mobile application. 15 February 2015 | As airlines around the world are currently in the process of developing an digital inflight infrastructure (e.g, Internet connectivity, aircraft intranet, inflight portal) and the latest generation of in-seat IFE systems has adopted the Android platform, the next phase for airlines is to develop innovative applications that differentiaite to the passenger experience. For example, on the IFE system of its new B787 Dreamliners, Air New Zealand and Panasonic have created a ‘digital crew call button’ app that lets passengers message the crew, as well as a dedicated digital button to order a glass of water and have it brought to their seat. Similar functionality has now also been rolled out by China Eastern – China’s second largest carrier by passenger numbers. The airline is not using the seat back IFE system, though, but has partnered with Microsoft to develop an airline-specific version of Microsoft’s ‘XiaoIce’ (東航小冰) intelligent personal assistant. 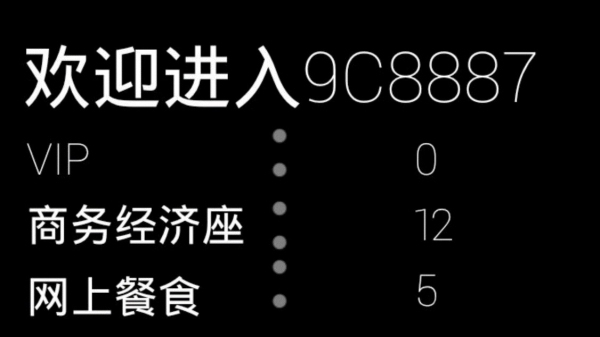 ‘XiaoIce’ – which translated a ‘Little Ice’ – is an intelligent personal assistant (IPA) launched by Microsoft in 2014. IPAs are software programs that can complete tasks assigned by the user or provide answers to users’ questions. Currently, the most widely known IPA is Apple’s Siri, which uses voice recognition to send messages, make calls and obtain answers to simple questions, such as those related to the weather and historical facts, on behalf of users. 27 November 2014 | Social media has provide passengers a powerful platform to voice their opinion on their travel experience. In a response, the airline industry is among the most pro-active sectors that monitor the online conversation. Furthermore, instead of just waiting for passengers to share their experiences (both good and bad) online, several airlines have also started to encourage passengers to provide their feedback about the service they encounter in real-time. For example, KLM has launched a mobile app that allows the airline’s passengers to give real-time feedback on how they perceived their experience at the airport. After downloading the KLM Feedback app, passengers first choose the airport they are currently at and then choose the area (check-in, lounge, boarding, arrival) and sub-area they want to rate. The rating consists of simply tapping a ‘thumps up’ or ‘thumbs down’ button, but passengers can also specify their rating with a comment. Singapore’s Changi Airport has installed an instant feedback system at selected check-in desks, immigration counters, retail stores, dining outlets and washrooms. Passengers can rate frontline service staff or the level of cleanliness on a five-point scale using interactive touchscreens. They can also indicate what they like or dislike. Another recent example comes from Turkish Airlines, which last month implemented a customer satisfaction measurement system at its İstanbul hub in order to measure passenger perception of the check-in process at staffed desks in real-time. The airline has placed survey devices – red and black-cased models to distinguish respectively Economy and Business Class service areas– on its check-in counters. 20 November 2014 | KLM is on a roll when it comes to surprising passengers with unexpected touches. In the past months, the airline has set up a dedicated ‘Lost & Found’ team at Amsterdam Schiphol Airport that aims to reunite lost items as soon as possible with their legitimate owner. The team uses all available information like seat number, phone numbers and public social media details to reunite passengers with their belongings a.s.a.p. And last month KLM took its social media-based customer service to another level with a bold campaign called #HappyToHelp. During five days, a dedicated team scanned social media for any passenger facing travel woes throughout the world, and responded with real-time answers and support. Showing the sheer diversity of stories of passengers travelling on the same aircraft on a given day, KLM’s latest effort is called ‘Cover Greetings’ and involved placing a personal message from loved ones staying at home to their boyfriend, girlfriend or relative on the headrest of their KLM aircraft seat. The airline spotted people saying goodbye to their families at the departure gate, then whisked their relatives away to a place where they could decorate a seat cover with their own message. KLM together with AmsterdamSchipholAirport worked together to ensure that the personal message was placed on the right seat in the aircraft. This made for an unexpected and touching moment for the passengers who boarded the plane as they saw a headrest cover made especially for them. The moving video showing the cover greetings and passenger’s responses can be watched online and is also currently played on a large, centrally located, screen at Amsterdam Schiphol Airport. Although the stunt took place on a single day, involving passengers from three different flights, the airline says it might develop ‘Cover Greetings’ into a permanent service. 8 June 2014 | This year, wearable tech devices are joining the digital mainstream, and airlines are jumping on the wearable tech bandwagon in order to test new applications as well as position themselves as forward-looking. Earlier this year, Virgin Atlantic’s six-week trial – featuring Google Glass and Sony SmartWatch 2 devices – in its Heathrow lounge creating a huge wave of publicity for the airline, while airlines such as Vueling, Iberia and airberlin have recently launched boarding passes for smart watches. Meanwhile in China, WCARN reports that the country’s first low-cost carrier Spring Airlines has equipped flight attendants with Google Glasses on a flight from Shanghai’s Hongqiao Airport to Chengdu, becoming the world’s first airline to deploy the device inside the cabin. Spring Airlines says it is embracing wearable devices to stay at the forefront of passenger service innovation. 7 April 2014 | In the fall of 2013, Delta Air Lines started providing Nokia Lumia 820 smartphones to all of its 19,000 flight attendants. The Windows-based devices feature an app that is based on the Microsoft Dynamics point-of-sale system and also handles passenger manifests, frequent-flyer information, connecting-gate updates, and flight-attendant scheduling updates. Now Delta has just announced it will be replacing the smartphones with larger Nokia Lumia 1520 ‘phablets’ and this fall will equip more than 20,000 flight attendants with the 6-inch screen devices. Dictribution will start in October with all flight attendants receiving the device by the end of the year. In addition to its functionality as an in-flight sales device and replacement for the on-board manual, the Nokia Lumia 1520 phablet, running Windows Phone 8.1, will, as it develops, enable flight attendants to take customer meal orders, receive detailed information about their flight and provide information for personalized service, including customers’ frequent flyer status and potential need for special services during flight. 1 March 2014 | Airlines have long used items such as onboard catering and crew uniforms to add a local touch to the passenger experience, be it often in a fairly traditional way. In recent years, however, several airlines in Europe have teamed up with local designers and brands to reinterpret elements of their inflight service in a more contemporary way. A well-documented example is KLM’s ‘Internationally Dutch’ brand positioning, which has seen the airline collaborating with well-known Dutch designers such as Victor&Rolf, Marcel Wanders and Hella Jongerius for respectively amenity kits, tableware, seat design and fabrics. According to KLM, customers have indicated that they appreciate KLM’s typically Dutch character, so it decided to embrace Dutch Design. Another forward-looking collaboration comes from Europe’s third-largest LCC, Norwegian, which has teamed with local hipster brand ‘Moods of Norway’ for the design of the uniforms for its crew on the airline’s long-haul low-cost flights. In May 2013, Norwegian started its long-haul operations between Oslo, Stockholm and New York, Bangkok and Fort Lauderdale. As a part of the new service the carrier dressed the crew working on the long-haul routes with brand new uniforms designed by Moods of Norway. Known for its quirky sense of humour, the Norwegian clothing brand bills itself “a happy brand” and has expanded internationally to Japan, Iceland and the USA. 10 February 2014 | Rapid developments in consumer technnology are a driving force behind many of today’s airline product and service innovations. For example, besides equipping their inflight pursers with tablets, airlines such as British Airways, Qatar Airways and Qantas have equipped their lounge concierges with iPads in order to offer a more personalised service to passengers on the ground. Now Virgin Atlantic is upping the technology ante and has started a six-week trial, together with airline IT provider SITA, to learn how wearable technology could improve the passenger experience and speed up the check-in process. “2014 is shaping up to be the breakout year for wearable technology, and Virgin Atlantic is the first to bring its vision to reality,” commented Jim Peters, chief technology officer for SITA, on the initiative. The trial will see Virgin Atlantic concierges at its London Heathrow Clubhouse lounge getting equipped with wearable tech devices in an effort to give employees more information about Business Class passengers arriving at the ‘Upper Class Wing’, the airline’s premium entrance at Heathrow Airport dedicated to Business Class passengers. Virgin Atlantic staff are equipped with either Google Glass or a Sony SmartWatch 2, which is integrated to both a purpose-built dispatch app built by SITA, and the Virgin Atlantic passenger service system. The dispatch app manages all task allocation and concierge availability. It pushes individual passenger information directly to the assigned concierge’s smart glasses or watch just as the passenger arrives at the Upper Class Wing. The technology will enable staff to identify a customer, see their flight details and preferences, and then immediately starts the check-in procedure of the passenger. During the escorted process, weather and local events at their destination, including translating any foreign language information, will be given to the passenger until they reach the lounge. The personalised service can also store preferences for future trips, and eventually could tell Virgin Atlantic staff their passengers’ food and drink preferences. SITA and Virgin Atlantics will also deploy Sony Smartwatches so that supervisors can evaluate staff requirements and availability. This article earlier appeared in Onboard Hospitality Magazine. 17 November 2013 | Social media has provided passengers with a powerful platform to voice their opinion on the experience they have with airlines. In response, airlines have become one of the most active organizations that actively monitor the online conversation in order to pro-actively take actions to correct issues if needed. However, instead of just waiting for passengers to share their experiences (both good and bad) online, several airlines have also started to encourage passengers to provide their feedback about the service they encounter in real-time. We have reported before on KLM’s mobile ‘Feedback’ app that allows the airline’s passengers to give real-time feedback on how they perceived the experience at a specific area (check-in, lounge, boarding, arrival) at one of 13 participating airports the airline’s network. The rating consists of simply tapping a ‘thumps up’ or ‘thumbs down’ button, but passengers can also specify their rating with a comment. Meanwhile, KLM team leads and station management at participating airports have been equipped with iPads that enables them to monitor the feedback in real-time, so they can react on passenger feedback immediately if needed and possible. 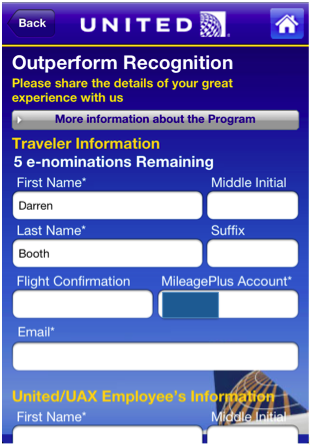 Following its merger with Continental, United Airlines launched a a service recognition program, called ‘Outperform Recognition’ in mid-2012, that invites United MileagePlus members to submit up to five nominations every four months through a variety of channels, including United’s mobile app, mobile website and Facebook page. Each period the airline selects 101 eligible employees randomly from the pool of eligible submissions, who receive a financial bonus of between USD 2,500 and 50,000. The first edition of the program (second half of 2012) received over 9,000 nominations. The option to recognize excellent service through the mobile app [screenshot] is the most innovative part of the initiative as it provides passengers an easy way to express their satisfaction on the spot and in real-time – especially since United has equipped the majority of its domestic fleet with inflight. 27 September 2013 | In 2003, Bahrain-based Gulf Air was one of the first airlines to introduce a special service for traveling families with kids: the Sky Nanny program. Gulf Air’s Sky Nannies offer help with boarding and disembarkation, hand out goody bags and give parents a much needed break during a long flight when it is time to take a nap. Every Gulf Air Sky Nanny is specially trained for inflight childcare services so parents can relax more during the flight. The nanny arranges drinks or convenient dining times (with on-board baby food) for the children and sets up the bassinet for the baby and check on them if the parents are sleeping. Sri Lankan Airways offers a similar ‘Child Care Stewardess’ service. Recently, Abu Dhabi-based Etihad Airways also introduced a ‘nanny in the sky’ concept (video here). The airline’s brand-new in-flight child assistance program, Flying Nannies, is designed for all travellers on long-haul flights and is available for every passenger, regardless of which class they are flying in. In the past year, Etihad Airways has trained 300 crewmembers to become experts in childcare. By the end of 2013, there will be 500 Flying Nannies trained in child psychology and sociology at the Norland College in England. The Flying Nannies, who will be dressed in a bright orange apron, help young families to have more comfortable and relaxing flights. From single parents traveling alone with a baby to families with several kids that all need attention, the nanny will help families with children as well as unaccompanied minors. She (or he) will serve special kids’ meals, see to it that the parents can enjoy their meal more comfortably and will even hand out drinks like full milk bottles, fruits or snacks for after the flight. 13 September 2013 | Equipping airline cabin crew with tablets and smartphones is the latest step in continued efforts by airlines to increase their onboard retail revenues. Since the end of 2012, American Airlines has been equipping its 17,000 flight attendants with Samsung Galaxy Note handheld devices, saying trials revealed that crew liked the fact that they could hold the device in one hand and easily slip it into a pocket – which is not always possible with a larger tablet. Besides being a means to provide crew with the latest passenger information, American uses the devices for onboard transactions such as the purchase of food and beverages inflight. Meanwhile in the US, low-cost carrier Allegiant has provided its cabin crew with iPads that feature the FlyDesk app from its subsidiairy Allegiant Systems, while in Europe TUI (Arkefly) has deployed MI.Airline’s Connected Crew solution using 7-inch Samsung tablets. The latest airline to provide its crew with a next-generation point-of-sale (POS) device is Delta Air Lines. The airline at the end of August started the roll-out of Windows Phone 8-based Nokia Lumia 820 handheld devices to flight attendants (or inflight professionals as Delta likes to call them) around the world in an effort to streamline the process for purchasing items on board and to put key flight information at their fingertips. Under the agreement, AT&T will equip more than 19,000 Delta flight attendants with Nokia Lumia devices powered by Microsoft Dynamics mobile point-of-sale platform on Windows Phone 8, with a Delta-specific customer experience developed by Accenture-subsidiary Avanade to operate over Wi-Fi and AT&T’s 4G LTE Network. Flight attendants began testing the Nokia smartphones during flights in June 2013 and in-flight trials have shown that the new solution is already around 10 percent faster than Delta’s previous systems. For more on the latest trends in airline hospitality, see our recent presentation at the 2013 Hamburg AIX Passenger Experience Conference. 12 June 2013 | The idea behind Air Canada’s new low-cost subsidiary Rouge is to offer a lower-cost alternative for several international leisure destinations to which Air Canada’s current cost structure makes it prohibitive to fly. Air Canada is hoping with lower wages and benefits along with a higher-density configuration of its planes, Rouge’s unit costs will be lower than the main line’s by about 25 percent or more. The airline will offer 13 leisure destinations in Europe and the Caribbean from Toronto and Montreal: Edinburgh, Venice, Athens; and a host of vacation choices in Cuba, Costa Rica, Dominican Republic and Jamaica. Destinations will be added in the coming months as the fleet grows, expected to reach 50 aircraft in the next three to five years. Rouge will launch service with four planes on July 1st and will start its inaugural flights that day from Toronto to Kingston, Jamaica, and from Montreal to Athens in Europe. As Rouge will be more leisure-focused compared with Air Canada, this means a change in style and attitude for their service staff. The airline says it aims to deliver a relaxed, casual onboard experience and just reveiled its new flight attendant uniforms, which are much more casual, with relatively-basic burgundy tops and grey pants, and shoes from Canadian designer John Fluevog. The outfits came together in just four months, by taking pieces that already exist on the market and having certain elements customized to suit the brand. “You can move quite quickly when you don’t invent anything new,” says Renee Smith-Valade VP customer experience of Rouge. L’Oreal has created “the look” for Air Canada rouge flight attendants, using products from its brands Maybelline New York and Redken Fifth Avenue. The crew will be equipped with a starter kit of the product, and will be trained on on how to use them. Rouge has also partnered with The Walt Disney Co – who has trained the likes of United Airlines and Alaska Airlines – to help with the training of its flight attendants to aid in the transformation. In addition to five weeks of safety and other training, Air Canada Rouge first 150 flight attendants will spend a week at the Disney Institute in Orlando to learn the ins and outs of its customer service model. They will also hone their skills and techniques at Disney World parks in Orlando.